Somebody loves me – Hello Korea ! IMG_0462, originally uploaded by Almost-Human. But it doesn’t just stop at t-shirts. You can also buy matching bras & underwear. Another common occurrence is men carrying their partner’s purses for them. Every guy I’ve mentioned this to says, “are you sure it’s not their bag?” Because the other guys here all seem hurt and offended that the men here carry “man bags” or dress metro-sexual in any way. Which, coming from Seattle doesn’t seem like such a big deal to me. In fact, I think that in large part there’s no reason for the foreign guys here to feel their masculinity is threatened or to be concerned about Korean men’s masculinity at all. That’s why I find it so amusing that the guys I’ve talked to haven’t noticed the Korean guys who are carrying their girlfriend’s purses. I mean, to me THAT is an interesting social phenomenon. That’s like being owned, or being someone’s lackey, or being a human coat rack or something. I find it pathetic on the guy’s part and passive aggressive on the women’s part! 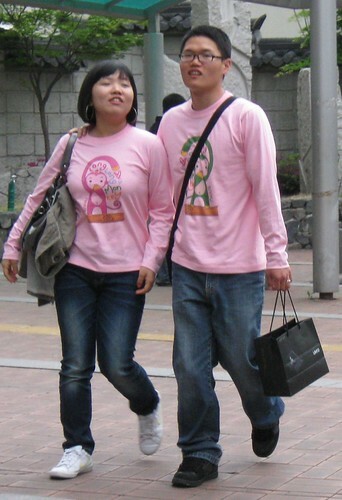 I’d like to dispel another thing I’ve read about, and that is that Koreans are against public displays of affection. I see it all the time everywhere I go. Or maybe it’s because I’m from Seattle where people are too cool for that, so I just notice it more. But in general, my impression is that Koreans are MORE physically affectionate than Americans are. There are always people giving little loving back rubs, best friends arm in arm, couples in some sort of embrace or another. It is also my impression that Koreans are more playful than Americans. They seem to constantly be playing pranks on each other or joking around. A lot of monkeyshines and affectionate teasing goes on. It’s very warm looking and I think I’m missing out on something. Another thing you’ll see here is more goo goo eyes. It’s kind of revolting, but maybe that’s just because we all wish we could be that basic and feel that good about someone. Maybe the nausea I feel when I see it is actually my external composure trying to violently kill the sappy romantic in me. Couples rule the day here. I feel like every Korean on the planet has a boyfriend/girlfriend. I think you need one just so you can eat something decent at a restaurant. For instance, there are A LOT of couples in the high school where I teach. Back when I was in school, that age, there were less than a dozen in my entire school. Because a person’s got to live with that choice socially for their school career, so a lot of care was taken and a lot of times done in secrecy so as not to be embarrassed. But the percentage of couples at a very young age seems to be quite high here. One of the attractive things about fundamentalism (not that it’s worth the price) is that these early relationships seem to be actual relationships and not just based upon sexual desires. So there’s a lot of young kids here doing couple things together. They’re living in over-crowded situations, they’re over-scheduled and under intense pressure, and they’re too young to rent a love motel or find any privacy whatsoever. So they hold hands. They do nice things for each other. They meet for wholesome things like going to the movies. Their vision is very near-sited and it’s comforting. I wonder how many of these relationships will survive the army conscription and college.